Set against the backdrop of London's dangerous East End in 1888, Victorian propriety and passions collide when a beautiful widow makes a wager with a wounded police detective obsessed with solving the Ripper mystery. Unlucky in love and estranged from his family, Detective Sergeant Benjamin Quinn has become obsessed with solving the Ripper crimes. When he's suspended from the Metropolitan Police, it's another failure in a long line of disappointments. But a new mystery arises when a beautiful widow shows up at the most infamous pub in Whitechapel seeking his help. 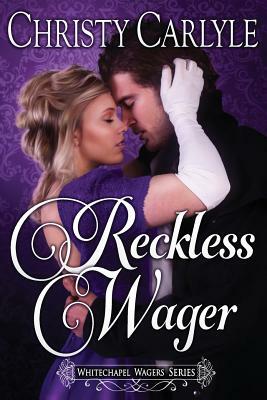 He's determined to assist Kate Guthrie, and equally determined to quell his growing attraction to her. Kate Guthrie hides painful secrets from her first marriage and has avoided matrimony for nearly ten years. Now she's finally decided it's time to remarry and move on with her life, even if it means giving up the charity clinic work in Whitechapel that makes her days worthwhile. But when a battered young woman turns up at the clinic claiming to have been attacked by Jack the Ripper, Kate seeks out Detective Sergeant Benjamin Quinn, a man who sparks feelings in her too potent to deny.